I'm here with the tutorial for that little flower I made in my previous post. I think it looks like a carnation, so we'll go with that! They're pretty easy to make. 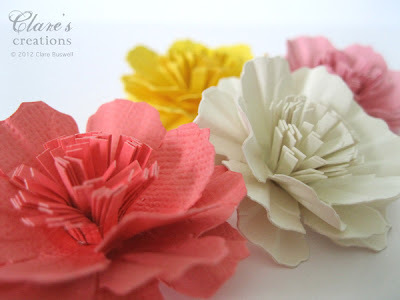 I used the Sizzix Tattered Florals die by Tim Holtz for the outer petals and the center is a fringed strip. I used the same weight cardstock I use to make my cards for these, so they're pretty sturdy! I was going to do a photo tutorial but I thought it might be easier to demonstrate in a video. GASP. I've never made a video before but I really wanted to try. So I spent today figuring it out! It's harder than I thought, the shooting part!! So my video is made up of clips, joined together! I played around with iMovie a bit so I think it all flows fairly smoothly although when I exported it, the text at the beginning and end went a little blurry but I think we can get over that! Labels: carnation, paper flower, tutorial, video. EEK, Clare! I love hearing your VOICE! What a genius flower, I think it could double as a daffodil, too! Thanks for sharing the cool details to make the flower so realisic! Made me laugh at the end when you calmly said "And that's it" and were holding this stunning flower in your hand, hee! I hope when I try this that I am not saying other words at the end of my project, giggle :) :) :)!! Such a brilliant first video, Clare...well done!! You did a GREAT job. Glad you talked through it. Will have to do some. Since I don't have the TH Die, I will have to use something from my Cricut carts. 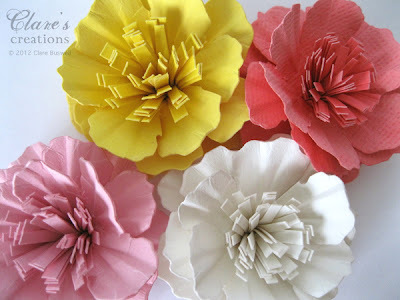 I think I already have some similar already cut out, so would just have to do the crimping and the center. Again, great job, please make more! Great tutorial, Clare! Thanks for sharing! Clare, I love hearing your voice - it's musical! Love your flowers - magic when you fluff out the fringed petals!! Thank you! Will have to try these - they are sooo beautiful! Thanks so much for the tutorial video. Thanks Oksana, I used a 280gsm weight cardstock but I have used a lighter 220gsm also that works just as well. Love, love, love this! 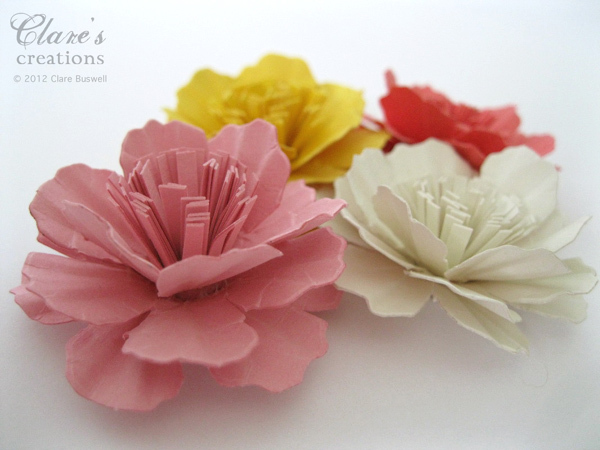 I did not have the die you used so I improvised with a Stampin' Up 5 petal punch I had on hand. I love the results! I linked today's post to your tutorial! Thanks again! GORGEOUS flower and great tutorial..thank you so much! BRILLIANT tutorial Clare! :) You've done such a great job with the video, very easy to follow. You show each step so professionally :) I will definitely give this beautiful flower a go :) Thanks for sharing, it's very inspiring! A fabulous tutorial. Thank you so much! Your tutorial is well done, your flowers are lovely, and your voice is quite pleasant! Thanks for sharing. Wow! Great idea. Thanks for taking the time to put the video together. It was very well done. Woweekazowey! Fantastic video! I dare say I will be making these beauties until the cows come home. Your video was clear and made this flower look totally doable. Brava! what a lovely flower, I'm aways looking for tutorials to make my own flowers, and this is a wonderful tutorial, thank you very much!!!! I can't believe that was your first video tutorial! It was just the right pace and so clear ! The flowers are beautiful, can't wait to give it a try. Thanks so much for sharing. Very very cool flower. I learned a lot from this tutorial. 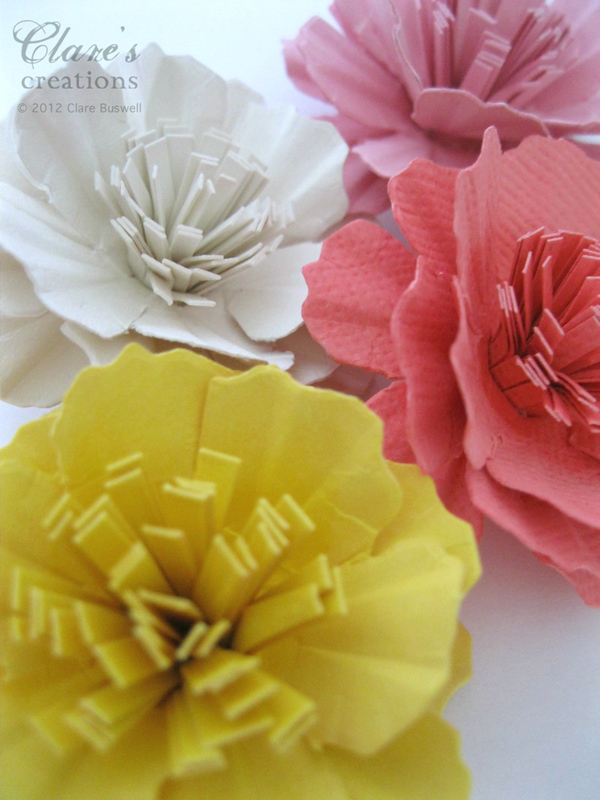 Thanks for sharing how you made these whimsical flowers with us. Was looking on the internet for retirement cards and found my way to your site and watched this awesome tutorial - totally forgetting about retirement cards - thank you for sharing! You have done a great job with your video and thanks for the tutorial. You explained it all very well and must try these. fab fab fab , just followed this tut and I now have a perfect flower before me . So easy and it was great as I had all the tools and die already. Must say I love your work , found you through crafters companion. Fabulous flowers. Just found your tutorial courtesy of jem - Jane has made some beautiful flowers following your tut - really must try this method myself. Bravo... une bien belle création! Bravo, une bien belle création! Such a brilliant idea. I love this, might try this soon!